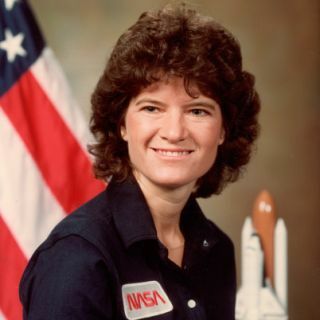 Sally Ride in an official NASA portrait. PERSONAL DATA: Born May 26, 1951, in Los Angeles, California. Her mother, Joyce Ride, resides in Pasadena, California. Her father, Dale B. Ride, is deceased. She enjoys tennis (having been an instructor and having achieved national ranking as a junior), running, volleyball, softball & stamp collecting. EDUCATION: Graduated from Westlake High School, Los Angeles, California, in 1968; received from Stanford University a bachelor of science in Physics and a bachelor of arts in English in 1973, and master of science and doctorate degrees in Physics in 1975 and 1978, respectively. Dr. Ride was a mission specialist on STS-7, which launched from Kennedy Space Center, Florida, on June 18, 1983. She was accompanied by Captain Robert L. Crippen (spacecraft commander), Captain Frederick H. Hauck (pilot), and fellow mission specialists Colonel John M. Fabian and Dr. Norman E. Thagard. This was the second flight for the Orbiter Challenger and the first mission with a 5-person crew. During the mission, the STS-7 crew deployed satellites for Canada (ANIK C-2) and Indonesia (PALAPA B-1); operated the Canadian-built Remote Manipulator System (RMS) to perform the first deployment and retrieval exercise with the Shuttle Pallet Satellite (SPAS-01); conducted the first formation flying of the orbiter with a free-flying satellite (SPAS-01); carried and operated the first U.S./German cooperative materials science payload (OSTA-2); and operated the Continuous Flow Electrophoresis System (CFES) and the Monodisperse Latex Reactor (MLR) experiments, in addition to activating seven Getaway Specials. Mission duration was 147 hours before landing on a lakebed runway at Edwards Air Force Base, California, on June 24, 1983. Dr. Ride served as a mission specialist on STS 41-G, which launched from Kennedy Space Center, Florida, on October 5, 1984. This was the largest crew to fly to date and included Captain Robert L. Crippen (spacecraft commander), Captain Jon A. McBride (pilot), fellow mission specialists, Dr. Kathryn D. Sullivan and Commander David C. Leestma, as well as two payloads specialists, Commander Marc Garneau and Mr. Paul Scully-Power. Their 8-day mission deployed the Earth Radiation Budget Satellite, conducted scientific observations of the earth with the OSTS-3 pallet and Large Format Camera, as well as demonstrating potential satellite refueling with an EVA and associated hydrazine transfer. Mission duration was 197 hours and concluded with a landing at Kennedy Space Center, Florida, on October 13, 1984. In June 1985 Sally Ride was assigned to the crew of STS 61-M. Mission training was terminated in January 1986 following the Space Shuttle Challenger accident. Dr. Ride served as a member of the Presidential Commission investigating the accident. Upon completion of the investigation she was assigned to NASA Headquarters as Special Assistant to the Administrator for long range and strategic planning. In 1989, Dr. Ride joined the faculty at UCSD as a Professor of Physics and Director of the University of California’s California Space Institute. In 2001 she founded her own company, Sally Ride Science [http://www.sallyridescience.com] to pursue her long-time passion of motivating girls and young women to pursue careers in science, math and technology. The company creates entertaining science programs and publications for upper elementary and middle school students and their parents and teachers. Dr. Ride has been a member of the President's Committee of Advisors on Science and Technology and the National Research Council's Space Studies Board, and has served on the Boards of the Congressional Office of Technology Assessment, the Carnegie Institution of Washington, and the NCAA Foundation. Dr. Ride is a Fellow of the American Physical Society, a member of the Pacific Council on International Policy, and currently serves on the Boards of the Aerospace Corporation and the California Institute of Technology. She is the only person to have served on the Commissions investigating both the Space Shuttle Challenger and Columbia accidents. Dr. Ride has received numerous honors and awards. She has been inducted into the National Women's Hall of Fame and the Astronaut Hall of Fame, and has received the Jefferson Award for Public Service, the von Braun Award, the Lindbergh Eagle, and the NCAA’s Theodore Roosevelt Award. She has also twice been awarded the NASA Space Flight Medal.